Set on the sun-kissed Costa Smerlda, Isuledda is a leading LuxCamp that is nestled right on the edge of a stunning sandy beach. Families are sure to be in their element here, as in addition to exploring the area, the site offers activities and amenities for people of all ages to enjoy. 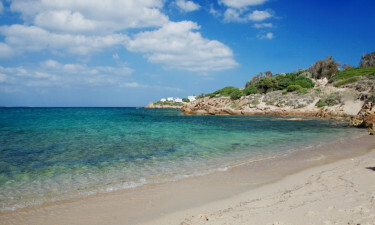 People who choose to use Isuledda as a base for their luxury camping experience will be able to explore all that Sardinia has to offer, with ease. A number of enchanting islands can be reached by a short boat trip, while cycling along the coast is a great way to get to know the area. Guests can also spend plenty of time unwinding on the site and simply soaking up the enchanting ocean views. A cool, onsite pool overlooks the ocean and is a great place to unwind. The kids can splash around in safety here while their parents spread out on the sun loungers. Guests will find a beautiful sandy beach just a few steps from their mobile home and this is the perfect place to relax for a while. The site also boasts a sailing club for people who want to practice this engaging activity and spend time messing about on the water.